Juki MO 1000 Serger With Jet Air Threading Technology $1,299.00 - FREE SHIPPING! 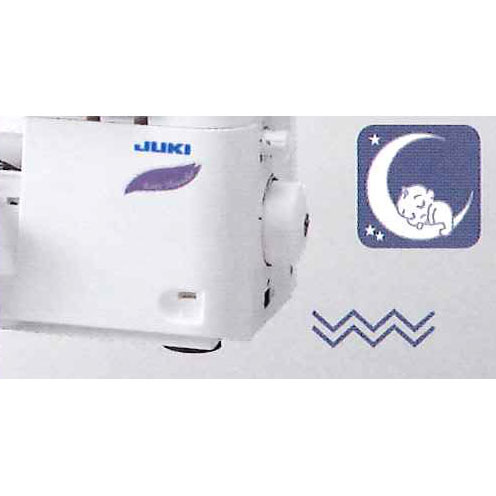 The Juki MO 1000 is a home serging machine that takes all the hassle out of threading a serger. 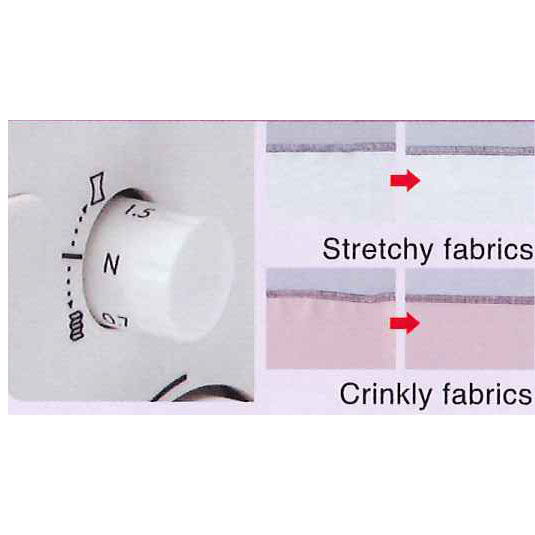 This model is loaded with important features that not only produce a great seam but take the mystery out of serging. Perfect for the sewist just learning to serge, the MO 1000 offers all the quality that Juki is noted for in a compact, convenient machine. The MO 1000 is a 4-thread, 2-needle serger and overlock machine that comes packed with the most important features, including Juki’s special Jet-Air threading technology. No longer is threading the loopers a hassle, as this machine threads itself at the push of a button using only a burst of air sent from the electric motor! Threading mistakes, struggling with thread guides, and poor quality stitches are a thing of the past with the MO 1000. In addition to the amazing air looper threader, the MO 1000 also has automatic needle threading, an upper looper 2-3 thread converter function, and knob-adjustable differential feed. 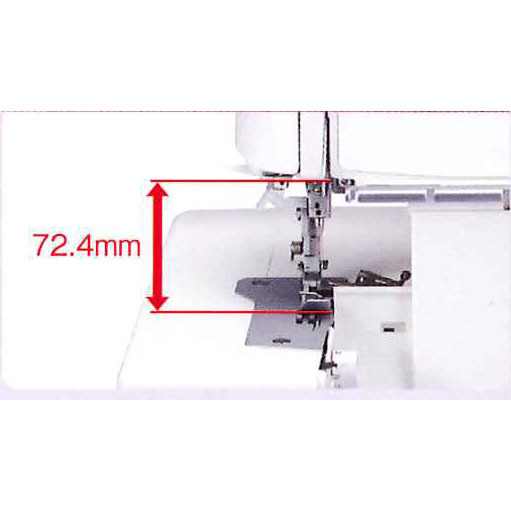 It also has easy stitch length and thread tension dials for perfect, custom adjustment with any fabric. These and other features make serging different types of fabrics, including knits, quick and easy while obtaining the best results. 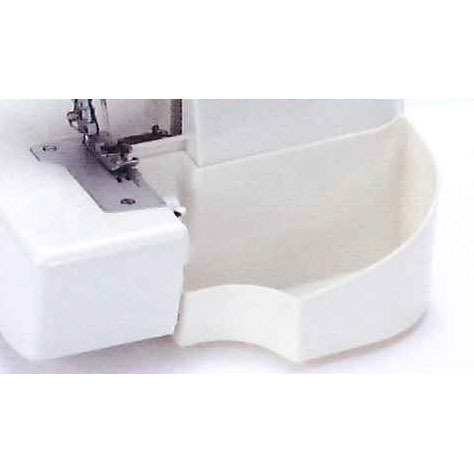 It has a top sewing speed of 1500 SPM for quick, easy serging, overlocking, and hemming. 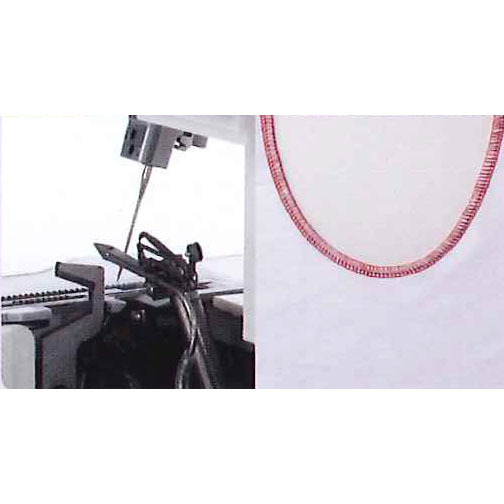 The throat between the top of the machine and the needle plate is over 70mm high, providing ample space for working. The workspace is brightly lit by a built-in, cool-running LED light that, combined with the throat space, makes the MO 1000 very user-friendly and easy to work with. Other features of the Juki MO 1000 that make it a versatile machine for producing professional quality garments and other items include adjustable presser foot pressure, cut width adjustment, the ability to deactivate the upper knives, a thread trimming blade, and a convenient waste collection bin to keep things neat. 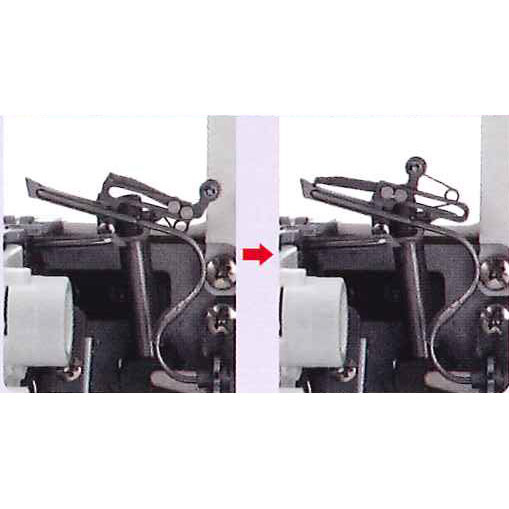 The machine also has a safety mechanism that prevents it from running while the presser foot is up. The MO-1000 is a compact machine measuring approximately 13” x 11” but it’s 20 lb weight makes it solid and stable when in use. This quiet running machine comes with a standard presser foot, a supply of needles and a threader, a tweezer and other machine cleaning tools, thread nets, a guide bar, an accessory pouch, a vinyl cover, and much more. The MO 1000 is covered by Juki’s 5-year warranty on mechanical parts, 2-year warranty on electrical parts, and includes 90 days of labor and adjustment coverage. Warranty applies only for personal use machines; commercial use of this machine voids the warranty. 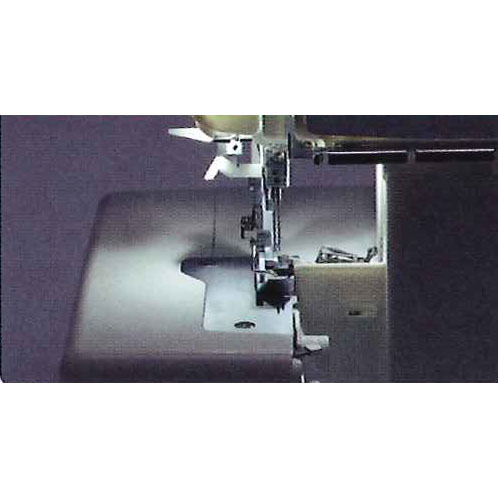 The Juki MO 1000 - The Easiest-Threading Serger Machine To Make Professional-Quality Garments! Even with easily stretched fabrics such as knits and georgette, create beautifully sewn finishes by adjusting the differential feed. Gather fabric with a true 2:1 ratio on any fabric you like knowing the end result will stay consistent every time. The distance between the needle and knife is 9.95mm (conventional model: 15.5mm), allowing you to sew beautiful inside curves. The height of the throat is 72.4mm, creating an easy-to-use, spacious workspace. The sound-reducing design minimizes the operating noise and allows the unit to sew with less vibration. The needle area is brightly illuminated, making serging less stressful on your eyes. Provided as a standard accessory, the waste collector catches cut-off fabric. 1. Insert 1 to 2 cm of thread. 2. Press the air-control pushbutton. 3. And you're done! The machine was simply threaded by air. Excellent machine, fast delivery! Very happy! Since my eyesight has declined, it is hard trying to thread my serger, so it was time for a push button threader. It was difficult threading the machine because once I pushed the button for the threading, the air was pushing the thread away instead of sucking it into the machine. With much difficulty I was able to thread the machine. After using the machine for three weeks, I loved it until I had to re-thread it. The machine was defective and too costly to have to struggle with the threading process. Therefore, I had to return it. The MO-1000 comes with a plastic catcher to collect the trimmings. The basket that catches the trimmings doesn't fit flush enough to catch everything. The actual sewing of the machine and adjusting the various knobs was an easy task and I was pleased with how the stitches looked. I didn't like that you had to resew over the stitches in order to secure the threads from unraveling. This isn't necessary with my other serger. I love this serger. I was intimidated by treading the others but wanted one so bad. I purchased mines from a sewing store. They give free lessons for a year and will clean your machine for free. It's worth it! I bought mine from a dealer so I got 5 free lessons on how it works. I love this machine and in the past week I was able to take a serger class from JUKI which was fun and learned different projects I can do. Learned how to make a table runner with a flat lock stitch.. Machine is a little pricey but well worth every penny and love the fact that it is easy to thread.